Chris Brown of AFC Stanground Sports is surrounded by Netherton players Ash Jackson (left), Herbie Panting (right) and Tom Randall (11). Photo: Davod Lowndes. Those expecting a hard-fought, competitive game when two of the top five in the Peterborough Premier Division clashed at the Grange on Saturday (November 12) went home disappointed. Indeed that wish was dashed in the opening 20 minutes as Netherton United scored four times without reply against their visitors from AFC Stanground Sports. It was a stranglehold they never released with 12-1 the rather remarkable final scoreline, one that was good enough to return Netherton to the top of the table. Stanground's Lloyd Mapes (blue) contests a loose ball with Netherton's Herbie Panting. Photo: David Lowndes. The hosts didn’t even have to work too hard. A suicidal high back line against the pace of Netherton’s forward line was always going to be a problem and it’s no exaggeration to say that the final score could have been far more embarrassing with more composure in front of goal. Stanground held out for 10 minutes, but then shipped four goals in the next eight minutes, two of them to Adam Scott with Rob Da Silva and Tom Randall also on target. That became 7-1 before half-time and five unanswered goals after the break completed the mayhem. The powerful Da Silva completed his hat-trick, fleet-footed Randall and midfield dynamo Ash Jackson scored two apiece with Scott Taylor, thanks to a fine finish from the edge of the penalty area, substitute Dan Fountain and talented teenage left-back Lewis Brisbourne also netting. Stanground, who had lost just four of 14 top-flight games before this one, at least had the consolation of claiming the best goal as left-back James McDonagh found the top corner of the Netherton net from 30 yards. Netherton's Tom Randall shoots at goal during the 12-1 win over AFC Stanground Sports. Photo: David Lowndes. And Netherton’s playing record could be about to improve. There is a claim that Stamford Lions fielded goalkeeper Alex Brown in their 3-0 win over Netherton on November 5 when he should have been serving a suspension following a red card picked up playing for Bourne. Lions are challenging the claim which is under investigation from the Lincs FA and the Peterborough League. 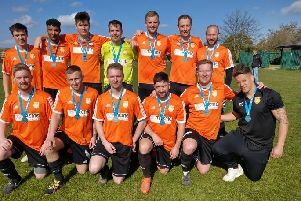 Whatever that outcome, Netherton face a tough task in fighting off the determined title challenges of Peterborough Sports Reserves, reigning champions Moulton Harrox and bang in-form Pinchbeck United. The only other team from that formidable quartet to have a league game on Saturday were Sports who maintained a magnificent recent record by winning 7-1 at Stilton United. Netherton's hat-trick hero Rob Da Silva goes for goal against AFC Stanground Sports. Photo: David Lowndes. The city side have won their last 12 competitive matches - 10 of them in the Premier Division - scoring 69 goals in the process! They shared the goals around at Stilton with Gerard Evans (2), Karl Gibbs, Jack Barron, Andy Boome, Mark Oxenham and Dan Drane all on target. Sports are now second, a point behind Netherton with two games in hand. Other top-flight winners on Saturday were Leverington, who crushed Deeping Rangers Reserves 6-1, Sawtry, who pipped bottom club Thorney 3-2, and Wisbech Town Reserves who eased to a 4-2 win at home to Uppingham Reserves. Substitute Mariusz Kudyba cracked a hat-trick for Leverington. Pinchbeck made progress in the Lincs Junior Cup by beating Division One side Long Sutton Athletic 3-0. Stamford Lions were impressive for the second weekend in a row in despatching Appleby Frodingham 3-1 in the same competition with all the goals coming in the second-half, but Crowland were smashed 11-2 at an excellent Horncastle side. Stilton United 1 (Neath), Peterborough Sports Res 7 (Evans 2, K. Gibbs, Barron, Boome, Oxenham, Drane). Wisbech Town Res 4 (Knight, Whyatt, Talmage, og) Uppingham Town 2. Postponed: Holbeach United Reserves v Ketton. Horncastle Town 11, Crowland Town 2 (Mason, Elsom). Stamford Lions 3 (Very, Brockbank, Forster), Appleby Frodingham 1. Postponed: Langtoft United v Ruston Sports, North Somercotes United v Moulton Harrox.